1. Discuss Shakespeare's Iago as compared with the original of the character. 2. Character and motives of Iago - is the character a logical and self-consistent one in its developments? 3. What is the constraining motive with Othello in killing Desdemona? 4. How do you explain the ascendency which Iago obtains over Othello in III. iii.? 5. How does the character of Desdemona rank among Shakespeare's women? 6. 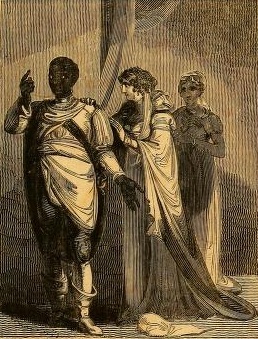 How do you reconcile Desdemona's character as described by Brabantio and as shown in the handkerchief scene, with her elopement and her bold stand before the Duke's council? 7. Do we excuse or condemn Desdemona's dying assertion that she killed herself? 8. How does Othello's suicide affect us as a matter of morals, and as to the dramatic necessities of the play? 9. What seems to be the relation between Iago and Emilia? 10. What change does Iago produce in the character of Roderigo which enables him to maintain his control over him up to the very end? 11. Illustrate by the roles of Roderigo and Emilia the importance to his plays of Shakespeare's secondary characters. 12. Show from this and other of Shakespeare's important plays the relation of the introductory scenes to the whole play. 13. Discuss the play of Othello as a whole; its rank among Shakespeare's plays; its lessons?